This comprehensive textbook aims to engage learners who are interested in both human neuroscience and the animal-based research from which so much of what we know about the brain is derived. The volume continues to present foundational knowledge and cutting edge research that spans the dynamic field of neuroscience from neural signaling through human cognition. The book is written and revised with the target of reaching students in the health professions and students at the pre-baccalaureate level who are studying the field of neuroscience. The book should also serve more advanced students who are pursing doctoral degrees in neuroscience. And of course, it should be extremely helpful for anyone in Medical Neuroscience who seeks the support of a textbook with a clear narrative style and detailed illustrations on their desks or in their laps. What’s new in Edition #6? I’m sure you are wondering what is different about this sixth edition of the book. You will find the greatest revision in the book’s Unit 5, which is devoted to Complex Brain Functions and Cognitive Neuroscience. There are entirely new chapters on Attention (Chapter 29), Thinking, Planning, and Deciding (Chapter 32), and the Development and Evolution of Cognitive Functions (Chapter 34). There are a variety of revisions and enhancements throughout the book, including new Clinical Applications boxes and new boxes highlighting recent advances in the field. I’m particular proud of a new box that I wrote on “Minds and Machines” (Box 17B) highlighting the astonishing advances in brain-machine interfaces. Box 18 is another new box I wrote that introduces a topic in motor control not previously discussed in the book: “Making and Breaking Habits”. This box discusses exciting new work on the basal ganglia, including work recently published by several of my colleagues at Duke University. Other new features are designed to enhance the anatomical accuracy of many of the pathway figures. For example, the axons of the corticobulbar tract shown in Figure 17.4 now emerge from the compact fascicles of white matter in the ventral brainstem. In previous versions of this figure, the axons seemed to send collaterals from somewhere near the middle of the brainstem, which was not sufficiently accurate. There are also new images in the Atlas at the end of the book (Plate 5) showing structure in the white matter of the human brain revealed by diffusion tensor imaging (DTI) tractography. I was delighted to collaborate with the designers at Sinauer Associates and Oxford University Press on the cover of this edition. 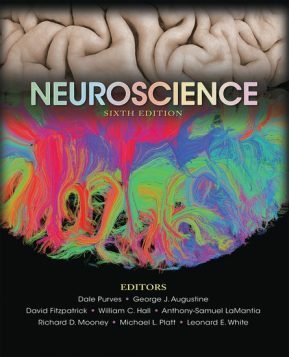 The cover incorporates DTI tractography while preserving a partial surface view of the human brain (see image below). My goal for this cover design was to represent our aim to provide the “big picture” (surface view) as well as the important details “below the surface” (DTI tractography) that convey the wonder, excitement, and complexity of contemporary neuroscience. After all, the brain is the most complex organ in the human body! But you don’t need reminding of that obvious fact. I should also mention that each new book includes a one-year subscription to the companion software, Sylvius 4 Online. There are no changes to the software at this time. I do hope to make significant enhancements to Sylvius in the coming years. There is also a new “dashboard” for registered users where you can find similar learning resources online as in previous editions of the book, plus new chapter quizzes covering important details and key concepts. Some of you have asked about my personal involvement in this book. Formally, I am responsible for Unit 3 Movement and Its Central Control and the Appendix: Survey of Human Neuroanatomy. I also authored boxes in several other chapters and offered editorial guidance to numerous anatomical figures and Clinical Application boxes throughout the textbook. It was a long and arduous effort by everyone involved to bring this edition to market. I am deeply grateful to Sydney Carroll and Martha Lorantos at Sinauer Associates for their guidance of this project. I am also profoundly grateful and inspired by my co-editors and co-authors who have created such an extraordinary contribution to neuroscience education. As with any significant project, like Medical Neuroscience, there may be errors that we have missed and passages that seem confusing and unclear. If you find such instances, please do let us know by sharing your feedback using this online mechanism. You can also share your feedback in a discussion forum on Medical Neuroscience. What does this mean for Medical Neuroscience? That’s a very good question! I will be working diligently throughout the summer and into the fall to revise the content of Medical Neuroscience by introducing the new figures that are in the sixth edition of the textbook. I will also revise the content of my lessons to align with what’s new in the book. This means new lessons on cognitive neuroscience that correspond to the new chapters in Unit 5 of the textbook. I also plan to make other updates and additions to the course, now that five years has passed since first launching Medical Neuroscience. Can it be that long?! Time has past quickly thanks to the encouragement and contribution of so many of you who have shared your passion for the brain sciences in Medical Neuroscience. Thank you for all of your support these past five years! Together, we truly have created something very special: the most diverse and inclusive community of learners in the history of medical education!